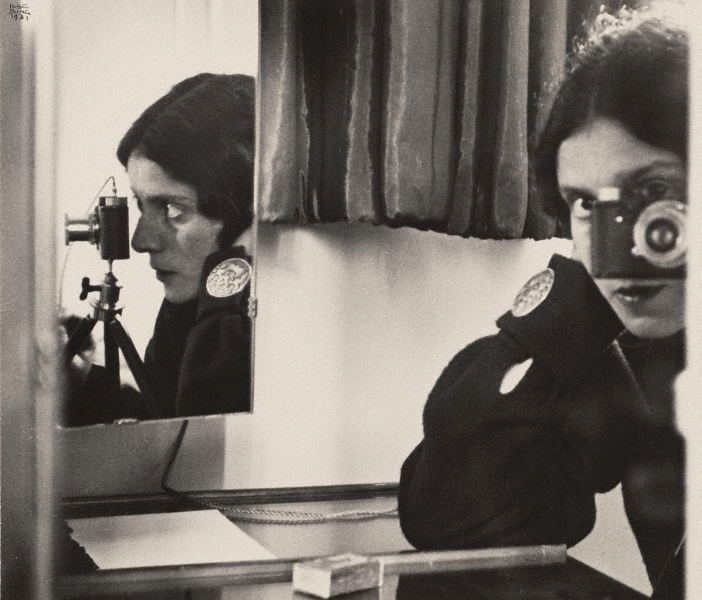 ‘Self portrait with Leica’ is a complex image in which the artist has photographed herself and her trademark Leica in one mirror, while the profile of both is reflected in another. The large button on her cuff disturbs the play between full face and profile, while the objects at the bottom of the frame lend a certain informality to an otherwise highly contrived set-up. The soft velvety curtain behind introduces a further element of rich tactility. The play between black, white and shades of grey softens and enriches the overall image. Although Bing avoided becoming part of any specific movement of the 1920s or 1930s – for example, constructivism, the Bauhaus or surrealism, describing herself as being ‘on the edge of the periphery of the Bauhaus’ only – she was fully cognisant of the range of experimentation which was taking place across Europe. She forged her own path, combining an abiding belief in the importance of intuition and poetry with rigorous composition and superb technical skills. Signed and dated u.l., ink "ILSE/ BING/ 1931". Judy Annear, Photography: Art Gallery of New South Wales Collection , 'The photograph and portraiture', pg.15-31, Sydney, 2007, 11 (illus. ), 28 (illus. ).